Join us for our 2nd annual Beer Run! Meeting at Tri & Run Sports at 5:45pm we will relocate to our host Gourmet Diem where the run will start at 6:00pm. 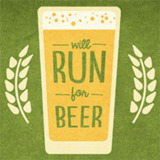 You will run 5k from Gourmet Diem on a 1k loop, stopping to drink a small serving of beer or pop after each loop. Following the run Gourmet Diem will remain open if you would like to join us for a local craft beer or another refreshment!